Some of the students on the Berkeley Dig have escaped the orange clayey swamp and have engaged in creating site plans and other scientific illustrations using the art of archaeological drawing and digital reconstruction. A site plan is a measured scale drawing of an individual trench or feature. They are drawn from a bird's-eye view perspective which allows archaeologists to refer to them during analysis and interpretation as well as during the production of accurate reconstructions. The students have been using an EDM (Electronic Distance Measuring) device as well as other techniques such as offsetting with tape measures to calculate accurate distances between features. They then transfer the results onto a hard copy format using rulers, pencils and Permatrace (more robust, waterproof tracing paper). 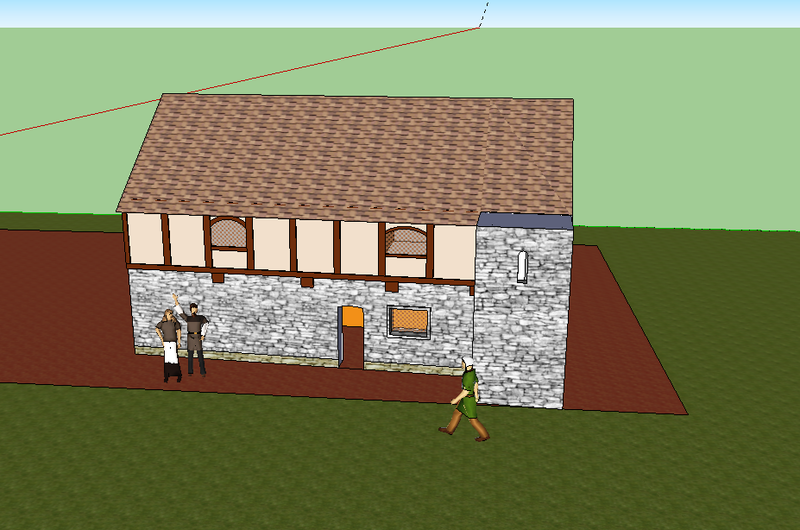 This year, 2nd and 3rd students have been using Trimble SketchUp to reconstruct a Norman house, using ground plans as the basis from trench 8, Nelme’s Paddock. Trimble SketchUp is a 3D modeling programme, which works in line with drawing with paper and pen, but it’s actually quicker and easier to rub things out and edit. Whilst the entire construction is theoretical, the reconstruction is a learning resource and may be helpful to younger visitors, who may not as readily envisage what was there. The project has allowed students to see how far they could take Trimble SketchUp as a 3D modeling tool. The reconstruction has allowed the illustration of different theories and ideas about the Norman House. Site supervisor Sian has suggested that a stairwell was on the outside of the house, as there is evidenced by the debris on the side of the house foundations and the door of the house being more to the eastern side. Another reconstruction that is in line with Director Dr Stuart Prior’s theory, is that the door is where the hearth was in the previous reconstruction, and the stairwell on the side on the house protruding up to the upper floor. What have you guys learnt from this experience? “It has taught me how to use stumble sketch up”. “How quick sketch up is as a tool and it’s highlighted how long these things take, because people take for granted how long drawings take”. “Using the programme has already improve on my drawings, but the limited time on the dig hasn’t really allowed me to go back and edit them. Also by doing this, it puts into perspective how large the trench actually is, because some people will look at the house in trench 8 and think its actually a tiny shed, but by reconstructing it, and putting life sized models next to the house you can actually see the true size of the Norman house”. The Big Bristol Berkeley quiz! Students working hard despite the weather. A successful first week at Berkeley.